Texas Freckles: Jumping in and a little giveaway. Do you ever spend so much time tweaking something in an effort to make it perfect that it never gets finished? Last year, I started working on a Big Cartel store to sell my winning Spoonflower fabric and it's still not live. But today, I've decided that I should just jump in. It's never, ever going to be perfect and if I keep thinking about it and not doing it, it will never go live. So, here it is... my online shop. You'll find fat quarters of my original Cheater Friday print from Spoonflower, some jewelry (I'll save that for another post), and a couple of quilts. 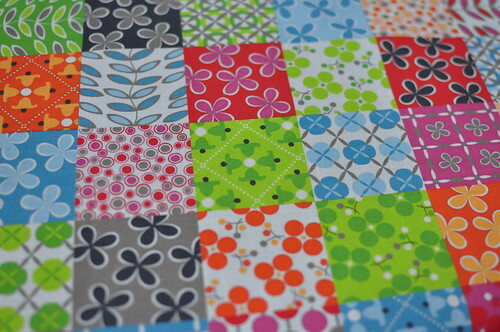 I don't think I ever blogged that my Cheater Friday fabric was the #6 bestseller on Spoonflower in 2010. Um, wow! I was so excited! I recently changed the pink and red in the Cheater Friday print to get it closer to my original vision. Fat quarters of the original print are available now in the shop for $8.00. I've ordered some of the new version too (above) and I'll add it to the shop soon. Those fat quarters will be $10.00. To celebrate me giving up on perfection (in this case) and jumping in, let's do a little giveaway. print ready to become 1" hexagons. ﻿I'll let the random number generator pick a winner on Sunday night. Good luck! I'd love a chance to win them...having just started a hexagon quilt recently...they'll be perfect. Very pretty, congratulations and thanks for the chance! Very neat! Would love to win the squares! Cute! I have been meaning to try smaller hexagons... right now I am working with 4.5 inch ones. OOOH! I would love those squares for my hexagon quilt. My fingers are crossed! Good for you! The quest for perfection usually means it just never ends up happening. I'm glad you conquered that demon! Good luck with your new shop! haha! Love "giving up on perfection". I think that's usually letting go of stress too. i'll toast to that! Your fabrics are gorgeous, thanks for the chance. good luck with the shop. Great!!! Now those would be the start to my hexi quilt. A hexi quilt is on my wanna do one list. Yes it is a long list but i keep pecking away at it. Very Cute! I would love to win! I love your fabric! Thanks for giving some away! Very pretty! I would love these little jewels to make their way to my home. Happy quilting! congrats on opening the shop! i definitely can relate with the waiting on perfection for things. i have also been waiting for ages to open my own shop as well. best of luck to you! I would love to win! I found your blog looking for help with the Anna Maria Horner hexagon pincushion. I am now addicted to making hexagons! I would love a chance to win this giveaway. The colors are so fun. Love those fabrics. I really need to figure out Spoonflower and see what is on there. Thanks for the giveaway. So good to see this avaliable now. I've been waiting forever it feels like to be able to order it directly from you :) Of course winning some would be even better. Yeah for you! Way to go on the online store and YES I want the squares!! That's the way of the entrepreneur - jump in and do it.....perfection never comes, it eludes us all! Good luck with your store, I think it looks nice! Well, I learned how to do hexagons from you online so it's only appropriate that I make some with Your beautiful fabric one day. Would love to own these for starters. That would be awesome to have them - I've been making hexagons like crazy using your information! Wow, congratulations on the success of your fabric design! I'd love to win some squares. Congratulations on opening your online store! What an accomplishment. Thank you for the opportunity to enter your celebration giveaway! Awesome! Congrats on jumping in! I love the colors and prints you're offering! thanks for the opportunity! Well, these are very beautiful, I would love to win! I would love to win. I've been wanting to start making hexagons and this would really help! Great prints and colors! For someone who's giving up on perfection, those squares sure do look perfect to me. ;) I'd love to win them. I would love these. I'm needing to cut more squares for my hexagon quilt. My quilt is in dire need of some new fabrics! Beautiful fabric! It would make stunning hexies! Congrats on your online shop, I'm sure you'll do well! Luv, Luv it and a chance to win, thank you. Congrats! I love your cheater fabric. Thanks for the chance to win. Your shop looks beautiful! I've never made hexagons before but it would be fun to start! Love your fabric and your name! We're looking forward to snow here in Houston tomorrow. It's one crazy winter! Thanks for the giveaway. I've been wanting to start a hexy quilt - this would be just the motivation I need! Congratulations on getting your shop up and running! Your cheater fabric is on my to-buy list when March 1st hits -- my hubbie's reward to me for lasting 8 weeks without a fabric purchase. Well I think this fabric is perfect!! I love it and I'd be so happy to use some in a quilts. Sweet! Those look so pretty! Thanks for the giveaway! ooh meee, meee ooh ooh meeee! Congrats on taking the plunge! Perfection is highly over-rated. I would love to win your yummy fabrics! pick me! pick me! hahaha. Oooh, so pretty! Congrats and good luck! I'd love to win these...they're awesome!! OMG - sooooo cute!! I would love to have these for my hexagon quilt I started a few months ago and am slowly making progress with when I can. I love that fabric. I agree, who needs perfection, just go with it! I'd love to be included for a chance at these cool fabrics... Count me in. I would LOVE to have these for my quilt! What fun fabric! I'm in. Congratulations! Both for the shop and the #6 spot. Oh, I just love all the limes! Oh, I love your fabric. The colors are great. 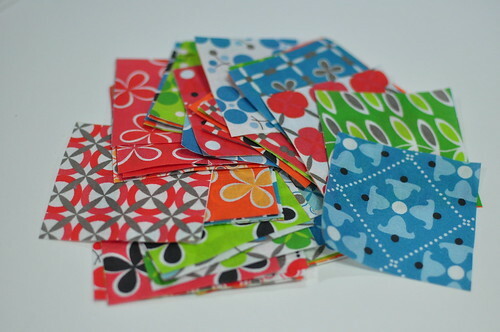 I totally just ordered the hexie accuquilt die, and those fit the small hexie! I would love to win. Congrats on #6 fabric. Cheers! Congratulations on making the plunge. That takes a lot of courage! Congratulations on doing so well with your fabric line, which is absolutely fabulous. I just loved this when you first posted about it-now it's looking even prettier! I would love them. I'm now in the process of cutting a lot of my scraps and stash into 2 1/2-inch squares and hoping to make some kind of nine-patch. These squares are so fun, they make me happy. I hope I win. Oh you bet I want 'em! Congratulations on your store! I think sometimes jumping in is the only way to get anything accomplished -- I can put things off forever if I start thinking too much! What fun fabric! I'd love to win it! Thanks for the chance to win I would love to put those fabrics in my hexagon quilt they are gorgeous. I so remember the cheater fabric!! I think they did a contest right? If so, I did vote for you...If not, I voted for someone, but could swear it was you!! The only thing I don't like about Spoonflower is that it really is a little pricey....I love FQ's but 8-10 is a little rich for a SAHM...but don't get me wrong your cheater fabric roCKS!! Awesome! I love these prints, any thoughts about making full yards available of specific prints? I love the colors in those fabrics; they would make great hexagons. Wow, so inspiring! Love the fabrics. Beautiful fabric! I would love to add these fabrics to my hexie quilt. I just recently discovered hexagons, and I would love to have them to add to the dozen I've made. Love your fabric. Thanks so much for the giveaway. Thanks for the opportunity to win such a cool prize Melanie! Congrats on the spoonflower success! That's brilliant. And thanks for the chance to win some of your lovely fabric design. I absolutely LOVE your cheater print! It's such a great way to get a huge variety of prints for hexagons...no wonder it made the bestseller list. Congrats on your store. I would love that fabric for hexies!! Exciting!!!! Yes, I do want some :) Thanks for the giveaway! Good for you getting the shop going! I love the fabric - how fun for hexagons! Way to go Melanie....have always loved everything you do! and congrats on your shop...it IS perfect! How awsome!! Congrats on the best seller. Seeing your post reminds me that I need to get back to work on my hexies. Beautiful fabrics! Thank you for the chance to win some. That would be a WONDERFUL birthday present for me! The 6th is my b-day, and that fabric is fantastic! Off to check out your shop! I've never made hexagons but have been wanting to give them a try. What better fabric to use than your vibrant florals? Thanks for the giveaway! Oh I love those! I am not surprised those are so popular on Spoonflower - pretty! I was wondering what happened to your cheater print...the one we voted on over at spoonflower. I would love to win these squares! Thanks for a chance! Thanks for the chance to win your squares. I am so ready to work on bright colors to get me away from looking at snow and ice for so long. Wow, thanks for the giveaway! I remember voting for that print and being glad it won! :) Those squares are so bright and cute! Very cool! It's awesome fabric, and how exciting to have so many people love it, too! Thank you for the chance to win some, and good luck with your new shop. Love the colors! I'm making new quilts for my grandkids and they would really spice things up! Thanks for the chance to win! Congratulations on your success with your fabric. That must be so exciting. Don't worry about perfection we have all of our lives to get that way. LOL!! I would love to win these squares how fun! Would love to add these lovely patches to my hexagon quilt. Thanks for a chance to win. Congratulations on the new shop, and thanks for the chance to win these lovely squares! Yes, i want them. Thank you for your generousity. Sometimes you just have to jump in! After visiting your blog a while back, I finally jumped in and started making my first hexagons - using fabric that I'd been "saving" for the "perfect" project. I decided that it was better to use it for something now that the possibility that it will never get used. So, see you inspired me to jump in without even knowing it! Love the fabric! Hope that I will win. Thanks for the chance. I would sew love to win!...These darling little squares are just the right size and would be so perfect to add to my hexies! You've done my least favorite step for me! The cutting, ugh I hate the cutting!! YES YES YES!! I just got into English paper piecing (I KNOW! I missed the boat) and would LOOVE to have theses cuties to help me on my new journey! Lovely! Thanks for a chance to win. Very colorful designs, great inspiration ! Yes, I want it. Greetings from Slovakia. Blogger crashed on me so hope this is not a duplicate comment. When you first announced your cheater cloth on the blog, I checked it out on Spoonflower. It was indeed the best entry (in my opinion). I am now making my first ever hexies, and your small squares would be perfect to use in my (hopefully) bed-sized quilt. Congratulations on your new shop. That fabric is totally adorable. Congrats on breaking the top 10! I'm so into hexies lately that my husband thinks I'm crazy. I'd love that beautiful collection of squares. Thanks for sharing! Love the colors, and all the fun prints, very quick way to make hexagons! Thanks for the chance to win! The perfect way for me to try out hexies! Love the bright colours! I'd love to win the squares as I am about 100 short for my hexagon quilt. What a coincidence because today I took out my pre cut paper backing papers and starting preparing some hexagons and blogged about it too! The fabric is perfect for hexagons. I would love to win. Congrats on the new shop!!!! Yes please! This fabric is beautiful! Thanks for the great giveaway! want them very much indeed. I love them! I love making Hexagons too. OOH! I need new hexagon fabric! PICK ME, RANDOM NUMBER GENERATOR! Congratulations on your new venture. I would love to have the squares, they are so cute! I'd LOVE to enter please - I've been drooling over your cheater fabric since you first posted it. These are great! I'd love to win these! They would really uplift my hexie quilt! I´d love to win this giveway. Congrats on your new shop and your very own fabric! Oh, what great fabric! I love the snappy patterns and colors. And congratulations on jumping in feet first. Sometimes ya just gotta do it! Congrats on the success of the cheater quilt-I remember voting for yours during the Spoonflower contest. C'mon random # generator pick me! I have a problem with perfectionism, too. It's inspiring to see someone just go for it. Best of luck to you! I would love to win these little bits of fabric beauty. gorgeous fabrics! good luck with your new store. i am a beginner quilter and would love to try with your great designs! What lovely fabric! Have never made hexagons before, but I feel like this would be a beautiful way to start! Nothing 'cheater' about it ---- just plain cute! they're so pretty! love the colors. i'm doing 1.5" hexies so they probably wouldn't work for that but i can think of 1 million other things i would use them for! And by the way I would love to win the squares! I love your fabric!!! Thanks for giving these away! loving your fabric designs and the vivid colors. please count me in! thank you! Love the prints and colors. Thanks for a chance to win. I love your fabric, and these would be great for a series of doll quilts I'm starting. Thanks for the chance to win your beautiful fabrics! I hope I'm the lucky one. And the best of luck with the new shop. i am glad for this giveaway as it prompted me out of my google reader - look at that beautiful header!!! what a lovely photo. Great colors and designs! I would love to do something with these. I've looked at your cheater print many times on Spoonflower... but it would be even nicer to win it:) I remember voting for you last year on Spoonflower, too. Where does the time go? Good luck on opening your new shop. Want them?? Oh yeah!! I can't imagine giving them away. What a fun contest! The fabric is beautiful. Love the cheater quilt too. It's super cute. We're in Houston and so far, no snow, only ice. I did stay inside today and work on an eye spy quilt with some old, old fabric I had. Wow, #6, that is impressive. I voted for you!!!Congratulations. Yes, please, I would love to have some of your cheater print squares. Good luck on your newest venture, what fun! Hi there. New visitor and new follower. Love your Cheater Friday print! Would love to make something pretty out of those squares, maybe even daring to make hexagons! :D Will browse more and so your other goodies. So, I really need some squares for hexies! LOL - thanks for the chance and best of luck in your new shop! Would love to try hexagons! I would love to WIN ! I will definately check out your shop ! Just found out my youngest is expecting our first grandbaby - and she is carrying three! I see lots of baby quilts in my future - your prints would be wonderfully bright and modern - just the right touch. They look so cute :) And I love how some of them look like they already have quilting/stitching on them !! Oh hey, it's you! I've oogled that print on Spoonflower. I'd love a chance to win! The colors are so bright during these dreary days in Georgia. Love your fabric and would love to win my first blog drawing! Your fabric is gorgeous. No wonder it was a best seller last year. I like the Zac Brown band and Chicken Fried is a favorite song. I can see why it is a bestseller......................! BEAUTIFUL FABRIC!!! The cheery/brighter the better. Like they say the hardest part is to take the first step. You are so brave!! Good Job!! Great fabric and congrats on getting you online store going and good luck with it. Better finished than perfect. That's my motto. Love your blog! Love that fabric! Had to buy a FQ - yardage was already sold out. Can't wait to get it. I'm just down I-20 from you. Soooo sick of this weather. I think more is coming from what I hear. WOW, this is my first ever blog comment! Maybe it'll be lucky. I would love to win this fabric, it would be great to start my mini travelling hexagons and I love the idea that they'd come from Texas...we are having a holiday to Texas from Melbourne in July! This fabric is so delightful! And congrats on the new web store...it looks great! Love the quilt and would love to win. love your fabric! congratulations on your new web store!